A year ago, I told Ollie that one day I wanted to wear the green and gold. I didn’t know if it would be the coming season or later down the track, but I wanted to do it. I’d looked up times of previous World Champs to see if this was even remotely possible for me and I could see it wasn’t completely out of the question. I’m a big believer in “where there’s a will, there’s a way” and that it’s possible to achieve anything if you put your mind to it; and one of the greatest things is that Ollie believes that too. Ollie supported my goal but tempered my excitement and suggested that this goal would be better saved for later down the track. After spending my first season of triathlon for the most part unable to run more than a few kilometres, if at all, we decided my goals would be to have a winter consolidating my training, strengthening my run in particular, and then a season of racing sprint distance with an Olympic or two as well, refining my race skills and gaining more and more race experience. I was reassured that there would be plenty of time and opportunity for qualifying further down the track, with it also being less competitive when the World Champs were not held in Australia. I have nothing but the upmost respect for Ollie’s guidance, and trusted and understood his reasoning so I spent my winter doing exactly what I was told, working on my strength and endurance (whilst juggling this with travel across the Pacific and Asia for work, and teaching placement in Norway – featuring a weekend trip to the 2017 World Champs in Rotterdam where I was inspired by our very own Bentley and Kat Lukey). Back in Melbourne, it was suddenly October with Noosa less than a month away. 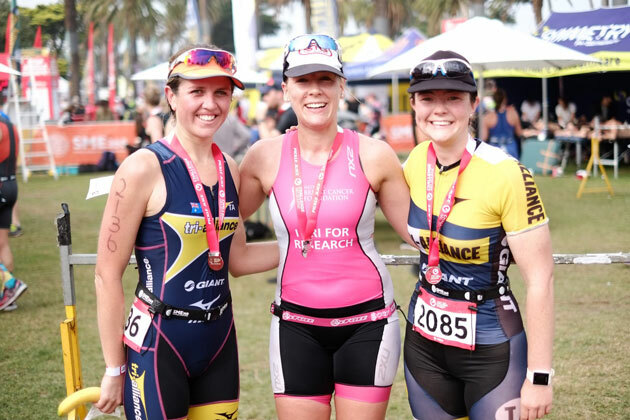 Noosa would be my first Olympic Distance and I was VERY nervous. I wasn’t worried about results at Noosa, just the sheer scale of the event. I’d seen the photos of transition and had let the scaremongers scare me and just wasn’t sure I was ready to be racing with thousands of others! After voicing my fears, Coach Scotty, and the good bunch of other athletes that were racing the Yarrawonga Mulwala Multisports Festival, convinced me to head north to blow out the cobwebs before Noosa. An unexpected 3rd place (and subsequent qualifying points) suddenly forced me to consider giving this qualifying thing a red hot go! The best thing about Yarrawonga was that there was no expectation, I’d barely told anyone I was racing and I hadn’t been racing with the aim of gaining points. 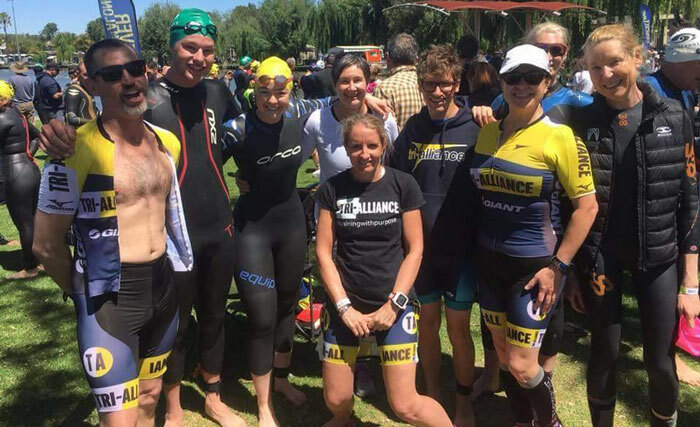 The group of athletes that raced at Yarrawonga was small but strong and I really have to thank them for their support, before and during the race but particularly after. I was (and still am!!) 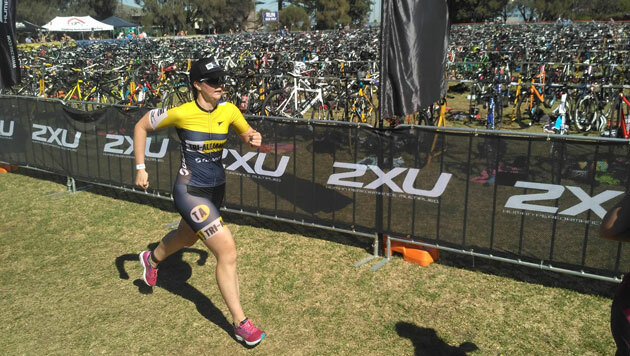 so new to triathlon but their reassurance and advice before the race was what got me there and without their elation and encouragement after the race, I may not have considered attempting to qualify. Sheridan, Paddy, Lisa, Jules, Brendan, Monty, Christie, Megan and Bentley – thank you. 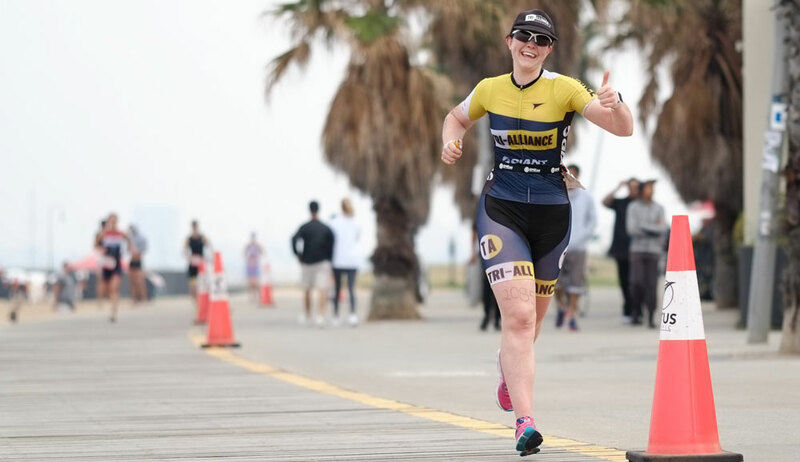 Coming back down to reality, I reassessed my goals with Ollie and we picked out the best races for me to do based on cost, timing and with our best guess of potential results. Suddenly, things became very, very real and serious. I had loved racing in Yarrawonga without many people knowing so I kept my next race, which was to be in Canberra, very secret. Thankfully I did because after looking at a previous version of the Triathlon Australia calendar, I turned up to race a day early!! I clearly remember Ollie’s very serious chat before the race where he told me that my goal was just to get out and gain more race experience, he assured me that there was no pressure or expectation for me to do well and that he would be proud regardless of the outcome. A much harder race than Yarrawonga but still draft legal (so much fun!) and also with the company of Sheridan out on course, I managed to come away with 5th place and yet again, more points. For those that don’t know, Triathlon Australia have a calendar of 11 races across the country where you can obtain qualifying points. The first 25 finishers are given points so 1st place gets 25 points, 2nd place 24 points and so on, with one race being a double points race. The other complicating factor is that the age groups between Triathlon Australia and ITU are different so those athletes who are in the final year of their age group (ie. 24, 29…) in Australia are actually already in the age group above in ITU. So, often I was racing against athletes who were, for qualifying points, in the age group above. This, in most cases, worked in my favour! The next race on my calendar was Moana Beach, in South Australia, and after many failed attempts at convincing Sheridan to give it a go too, I went over on my own. One of the most beautiful locations to race, I camped in the caravan park just metres from the beach and made friends with local retirees and fellow athletes. Thanks to the support of my newfound fans, I came away with fourth place. After a little break over Christmas, I next headed to Hobart with the company of Sheridan once again, and where I came away with another fourth place. With Ollie absolutely certain I had already done enough to qualify, I raced my final qualifying race in Elwood in February before taking some much-needed time off. I don’t think I ever fully relaxed until the preliminary team was announced a month ago, particularly as I had decided not to race the double points race, and have only really become properly excited now since the team was made official on Monday. It has been an absolutely incredible journey. I truly love racing and training, and I wouldn’t have done it otherwise! It was expensive, exhausting, time-consuming and at times lonely travelling and racing in other states but that was also one of the highlights, the people I met along the way. A friend of a friend drove me to Canberra, and I stayed with my third cousin; I had bus drivers tell me that they wanted me to win and airport check-in staff say that they wanted to give a triathlon a go after speaking to me, and other people stop me to ask what on earth it was that I was pushing along (thanks again Scotty for the use of your bike bag! ); I got to know fellow athletes from across the country and made friends with other guests and residents of the places I was visiting. Thank you to every single TA athlete who has supported me, inspired me and motivated me along the way. Whether you have been with TA for a day or a lifetime, you have inspired me and are part of the reason I keep doing what I do. Thank you to the coaches – Greg, Scotty, Jed, Weeksey, Dan B, Siddsy, and Paddy – your wisdom, tips and advice have had a huge impact and I am faster and stronger than I ever thought I could be thanks to you. Thank you to Bondy, for answering my endless questions, calming my pre-race nerves, and for your guidance and advice across all aspects of triathlon – the thought of your post-race phone call was often what got me to the finish line when I didn’t have the blue and yellow cheers to get me there. And Ollie, thank you for believing in me and teaching me to believe in myself. Your honest guidance, wisdom and expertise is second-to-none, and your persistence and encouragement lead me to love running – who would have thought! I am proud of the journey we have been on. And so the build starts now. The World Champs are on the Gold Coast in September and I have 4 and a bit months of solid winter training to do to get there! I am excited for the training and hard work, and for all the fun that will be had with every TA athlete along the way. Bring on steamy early morning swims in the outdoor pool, cold, misty hill rides, and post-Sunday runday brunch.